Looking for somewhere to Dance? It gives you a chance to put into practice everything you have learnt in your classes and private lessons. Repetition is the answer to many problems in dancing. We call it ‘dance miles’. It really is true, the more ‘dance miles’ you do the better you will be. Whenever we start a brand new beginners class everyone is at the same level, but the dancers that improve the quickest are the ones that go to more social dances. You are always good enough to start social dancing! 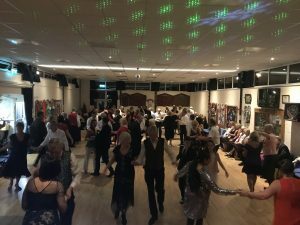 It helps you to get to grips with navigating around the dance floor with other dancers, which is certainly one of the major hurdles early on. You’ll soon find out if you’re going the wrong way! At our social dances we are always happy to help. Sometimes it’s just knowing what foot to start with or what the first move is to get the muscle memory flowing! We run social dances most Sundays and also once a month on a Saturday. We know some of you sometimes social dance elsewhere too and this is great as you’re getting even more practice! Please get the Saturday dates in your diary and also consider our Sunday Socials too. We play music for Ballroom, Latin and popular Sequence dancing. See our full listing of all our weekly events.